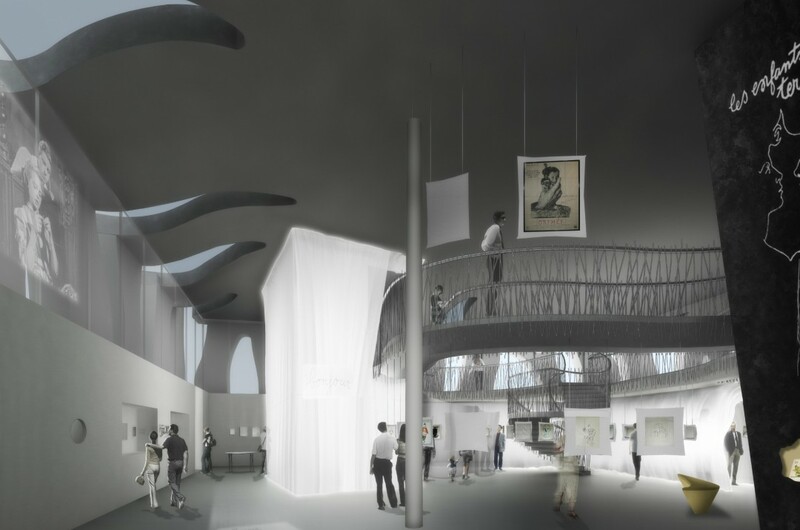 The extensive double-height space gives full view of the museographic concept and creates a rich and complex serpentine black and white itinerary: plunging and rising from an unconscious, dream-like state to a semi-dream-like and waking state to encounter “the work of the surrealist artists exploring the unconsciousness through dreams”. From the entrance hall, we can imagine more than we can see through the filtered entry created by the semi-transparent textured glass. The descent to hell, the mirror between life and death, as expressed in the poet’s work, are represented. 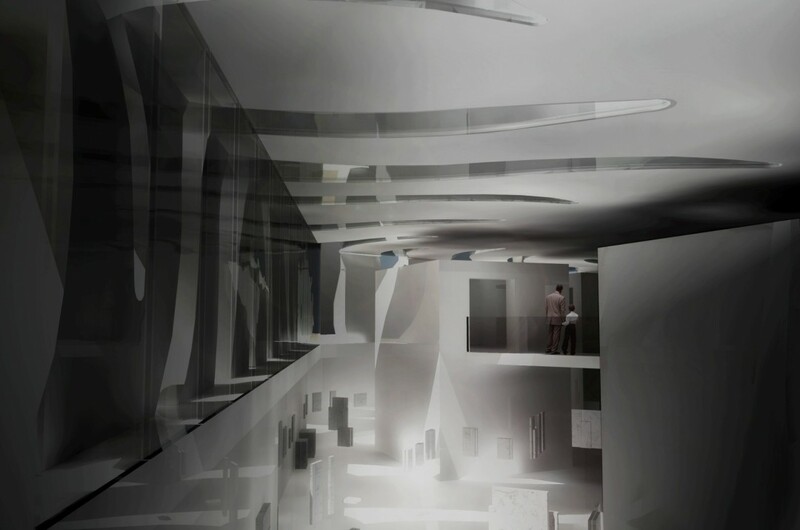 This idea of a labyrinth and the surprises it offers through the apparent disorder of semi-transparent supports such as mesh screens evoke the unforeseeable continuity and cross-links between the artist’s various facets. We are plunged within his universe. This “Piranesian” theatre’s large volumes are meant to create a screening area. Their scale is impressive with two retro black-and-white towers linked by oblique walkways, blending the chiaroscuro of his drawings and engravings. 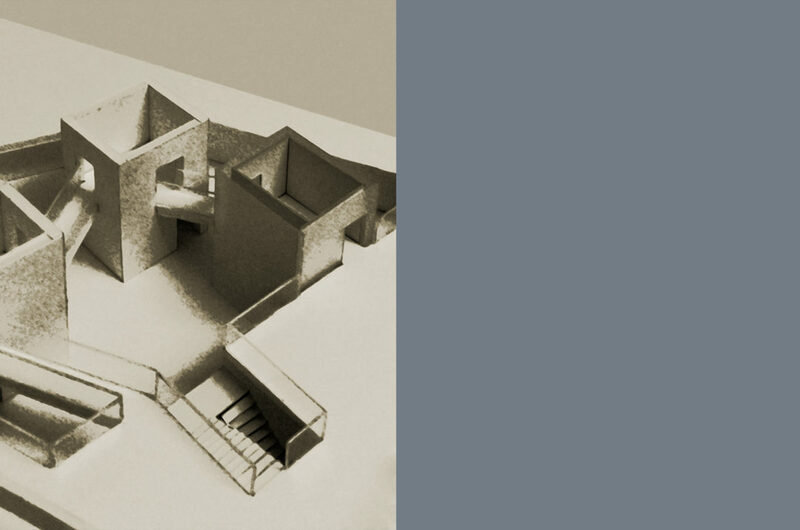 This Cocteau-esque atmosphere is inspired by Piranesi, the master of chiaroscuro architecture, whose work takes us into the depths of darkness to discover its mystery. 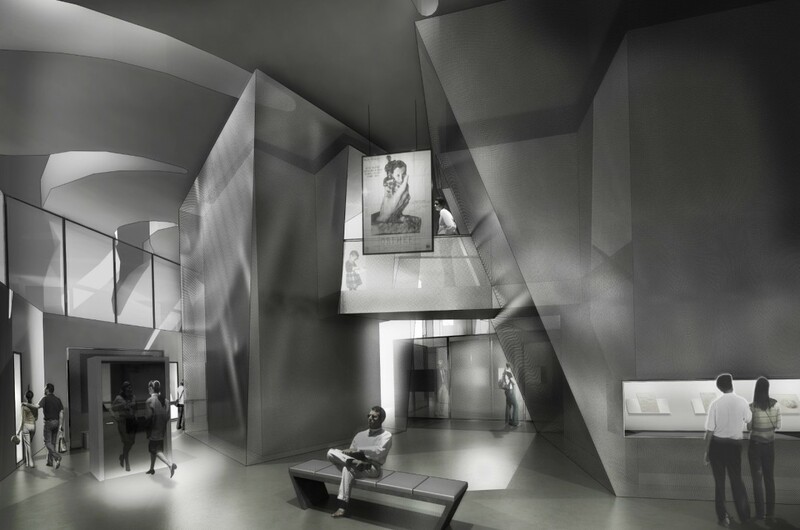 In this museum, it was necessary to create an atmosphere reflecting diametrically opposed forces of light and darkness to prompt the emotions of seeing, thinking, reflecting and dreaming. 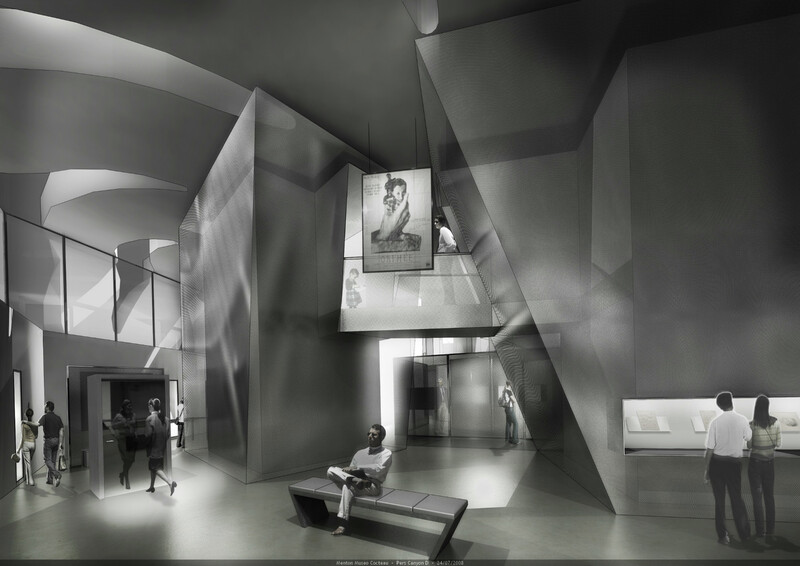 “I will write in film as I write in ink” said Henri Alekan, a fellow advocate of chiaroscuro architecture. This lighting scenography and, more specifically, the black-and-white aesthetics are necessary in this environment. The onirism, mystery and strength of contrasts and shadows reflect the contradictions of the work and life of Cocteau. Black and white are no longer colors but opposing forces creating surprises and illusions. The oneiric scenography reflects the omnipresent contradictions of Jean Cocteau’s creations and is an introduction to his universe via a journey through his life and works. The richness of the itinerary and its connecting sequences and volumes mirror this great artist’s unfathomable work and reveal Jean Cocteau’s complex forms of thought, expression and immense creativity. We take you through this winding museographic itinerary in reflection of the poet’s own meandering works. 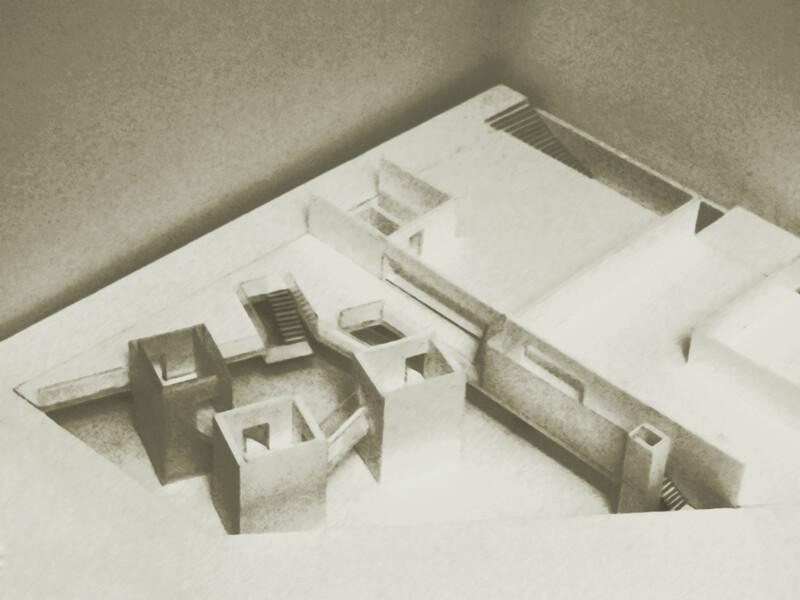 Design and realization of the Jean Cocteau museum, its museography and surrounding spaces’ urban planning.